To capture good photos, you need good lighting. In many cases, this means relying on your camera’s flash controls. When used correctly, your camera’s onboard flash can perform some of the magic that helps professionals change ordinary snapshots into fascinating photos. But to take advantage of these powers, you’ll need to switch out of automatic mode and make smart decisions about your flash photography. Many beginning digital photographers leave the camera’s flash set to automatic mode because they assume that the camera knows best. Even worse, some leave the camera set to the woefully ineffective red-eye mode, which sends out an annoying strobe light before every photo. But while these modes generally do a good job of making sure the image has enough light, they don’t provide much control. In many cases, you’ll get much better results by switching to one of your camera’s other flash options: flash on, flash off, or slow-synchro flash. Your camera’s flash-on mode is the perfect setting for many outdoor portraits. In automatic mode, your flash usually won’t fire outdoors because it thinks there’s already enough light to take the picture. And it’s right—there is enough light. The problem is that the light is usually coming from the wrong direction. Side lighting and top lighting, what we typically see outdoors, tend to make eye sockets dark, noses big, and skin texture rough—not very flattering. Illumination from the front—from your camera’s flash for example—evens out those features. Automatic (or auto) The camera activates the flash if—and only if—the light meter determines there is not enough light in the scene. Auto red-eye reduction A combination of auto and red-eye reduction modes. In this mode, the camera uses red-eye reduction whenever it determines that the flash is required. Please don’t use this as your default setting. Flash off Sometimes the flash destroys the mood of a shot. This mode disables the flash, allowing the camera to make the exposure with only ambient light. Flash on With this option, sometimes referred to as fill flash, the camera fires the flash with every exposure, regardless of the light-meter reading. Red-eye reduction The camera tries to reduce the effect of red-eye by shining a light at the subject before the flash goes off. The preflash light causes the pupils to constrict, which may—or may not—solve the problem. Slow-synchro flash Often referred to as nighttime mode, this setting tells your camera to use a slow shutter speed in combination with the flash. This way, it can capture more background detail in dimly lit scenes, such as portraits shot at twilight. Simply cycle through your flash modes until you find Flash On. 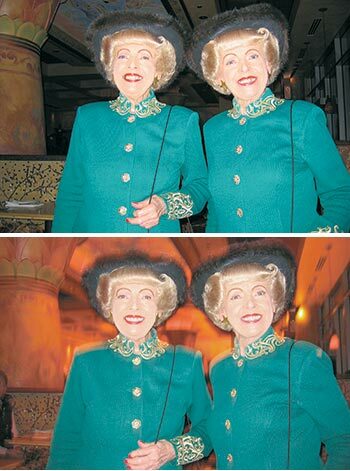 Make sure you’re standing within the flash’s effective range, usually about eight feet, and then take the picture. Your camera will balance the light from the flash with the background, resulting in an evenly lit portrait. Here’s an interesting and attractive variation on this technique: Position your model so the sun is shining on his or her hair from behind or from the side, and then force the flash to fire. This effect, called rim lighting, will give your model a lovely glow. Go Natural Sometimes a soft, natural light better conveys the mood of a situation. To get this effect, turn off your camera’s flash. Much in the same way that turning on the flash improves outdoor portraits, turning it off can help you capture great indoor shots. This technique is especially effective for window-lit portraits (see “Go Natural”). Steady the Camera Mount the camera on a tripod, compose the shot, and gently press the shutter button. Remind your model, if you have one, to hold very still during the exposure. The tripod steadies the camera and eliminates the shake. You can refine this technique by using the self-timer or a remote release to trip the shutter. That diminishes the possibility of jarring the camera at the beginning of the exposure. Finding Your Flash Before you can use your flash controls, you’ll have to find them. 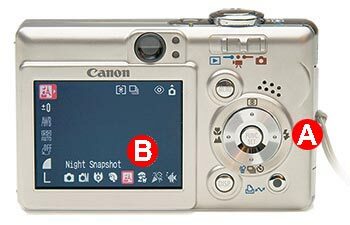 If you’re lucky, there will be a button control on the back of the camera that allows you to cycle through its options; look for a lightening-bolt icon (A) . For specialty flash modes, such as Night Snapshot (B) or Nighttime Flash, as well as other picture modes such as Portrait, Close-up, and Sports, you may need to look in the camera’s menu system. Increase the ISO If you don’t have a tripod available, try increasing the ISO speed to 400 or more. You can find the ISO setting in your camera’s menu. Hold the camera very steady and gently squeeze off another exposure. You should have a sharper image. The downside to raising the ISO is that you’ll likely increase image noise as well, especially with compact cameras. But this slight tradeoff is offset by the photo’s artistic mood. When you’re finished with the session, be sure to return the ISO setting to 100 for your everyday shooting. No matter which of these methods you use, you must make one more adjustment. When you turn off your camera’s flash to capture the natural light of a scene, images sometimes take on a bluish tone. That’s because the color temperature of indoor lighting is different than that of sunshine. Your camera has a hard time adjusting for this change on its own. To compensate, set your camera’s white-balance setting to Cloudy. That setting warms up your tones, giving your subjects’ skin a healthy glow. Get It All The default flash mode does a nice job of illuminating the subjects, but the background becomes drab. The slow-synchro flash mode brings the background to life and illuminates the subjects. When taking pictures in a nice restaurant or at a wedding reception, I like to capture a little background information in my portraits. Otherwise, you just end up with a flash-illuminated person against a black background. The setting could be anywhere. This is when the slow-synchro flash mode (sometimes referred to as Nighttime Flash mode) comes in handy. The camera slows down the shutter speed to capture the mood of the setting; then it fires the flash to expose the subject (see “Get It All”). The slow-synchro flash setting is sometimes included in the flash mode menu. If you don’t see it there, search your camera’s shooting modes. Once you’ve turned it on, make sure you’re within flash range, hold the camera very steady, and squeeze the shutter button. The exposure will take a while, so be sure to hold the camera steady for a few seconds, even after the flash has fired. You’ll see quite a difference in your photos. There will be much more information in the background, as with an existing light exposure, but you’ll still have a flash-illuminated subject. If you’re having trouble getting your subject in sharp focus, use a tripod to steady the camera. This will keep the background from blurring due to camera movement during the exposure. By applying these basic flash techniques, you can capture images that look just like a professional’s. 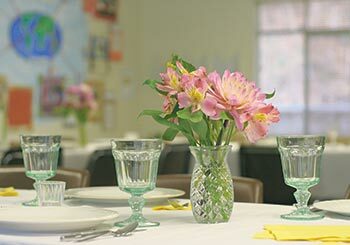 As with all photography, it’s best to practice a little before the next wedding or celebration you attend. That way you’ll have confidence in your shooting when the big event arrives.